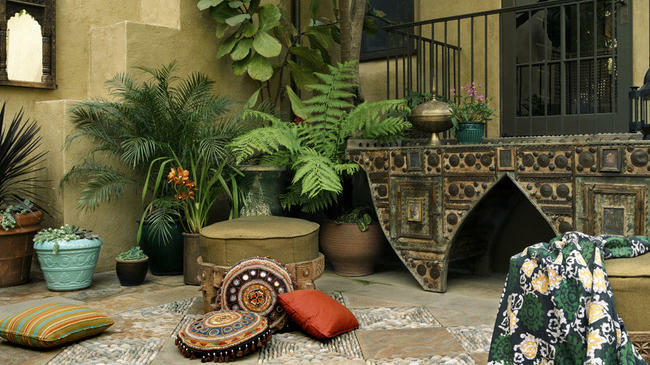 If you’re struggling with how to outfit a small patio, here’s some inspiration to help you breathe new life into it and make the most of your outdoor space. 2. Go tall in a sunken space. In an urban setting, any outdoor space is a luxury, even one below street level. You just have to make the most of it. A high-top table and tall planting bed complement the scale of this space. Leaves add softness and create a garden feel. 4. Add landscape lighting. Nothing ruins nighttime patio enjoyment like turning on the lone, way-too-bright spotlight you have in your backyard. Softer lighting on the ground and off the house can create a more pleasant mood. If you’re ready to invest in lighting, collect a few hurricanes and lanterns to keep the flames from blowing out in the breeze. 5. Take it to the edge. A small brick patio provides a level surface for iron patio furniture. Now seating is part of the shade garden. 6. Mix materials with thought. This patio sits in the back corner of the yard. A custom concrete and stone bench, coordinating concrete fire pit and flagstone floor tie it to the yard and the house. 7. Go vertical with plants. Trellises, narrow planting beds and containers are good ways to bring life and height to a small walled-in patio. 8. Bring in bright color.Make the most of the small space and add color to the garden with brightly colored furniture. 9. Carve out a lounging space. A simple grid of pavers set in gravel provides a flat surface for these two loungers and an umbrella to nestle into the garden. 10. Cozy up with larger pieces. Tiny patios don’t need to be full of tiny things. Four comfy chairs nestle into an arrangement that encourages hours of alfresco conversation. 11. Play up surfaces. A plain concrete slab certainly has its place, but the surface of your patio is a big opportunity to add color and texture. Here, pavers and individually placed stones create a tactile checkerboard effect. 12. Push a table up against the wall. On a narrow patio you may not be able to have a larger table surrounded by chairs and still be able to pass through. But if you consider shoving it to the edge when not in use, you can have the best of both worlds. 13. Make the most of walls. On a patio without much space on the ground, use walls to mount elements like fountains, sculptures, window boxes and lighting.